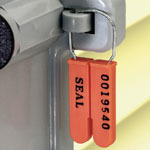 Budco's plastic padlock indicative security seals are a versatile and reliable choice for dozens of industry needs. 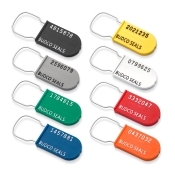 Our padlock seals are sequentially numbered, are available in a variety of colors and the plastic body shows signs of tampering. Barcoding is available. 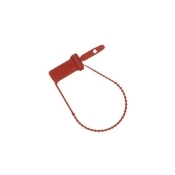 We also offer split-lock padlock seals as well as spring-lok plastic seals. Split-lock padlock seals are ideal for many security seal uses because of their unique central membrane that breaks if tampered with. Spring-Lok plastic padlock seals provide reliable security for containers, totes, electric meters and other uses by self-locking with an innovative hinge design. These padlock seals are sequentially numbered and blush upon tampering for fraud protection. We are a stocking distributor of padlock security seals. Stock orders ship in 24 hours. Custom padlock seals also available. Have questions? Call our trained staff at 800-747-7307. Our offices are open Monday-Friday, 8 a.m. – 5 p.m., CST. Local customers may also call 918-317-0066. Or, if you prefer email, click here. 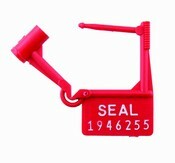 Click to view our full product line of Plastic Padlock Seals and Security Seals.